As we take communion this morning, may we never lose the wonder of the sacrifice of Jesus Christ on the cross on Calvary. Communion should never become a ritual act, but every time we partake of the bread and the juice, we are remembering the body of Christ that was broken, and the blood of Christ that was spilt on the cross as an atonement for the sins of the world. This should be the same response for us as we partake of communion this morning. May we be overwhelmed with wonder as we gaze upon the cross. It is a wonder because what you see is the creator of all things – the creator of the stars, the heavens, the oceans, the mountain’s; the creator of all living things dying for His creation, dying for the very things He formed and created. This is an amazing act of love and sacrifice. 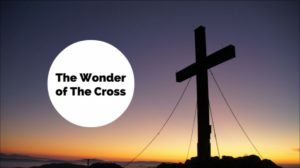 There are 2 things that happen when we gaze upon the wonder of the cross, first we see His ‘Saving Sacrifice’ and secondly His ‘Shining Example’. what humankind could not do, the Son of God accomplished; to live a sin free life and die as atonement for the sins of the world. Christ wiped out a note of debt. What kind of debts did Christ cancel? He cancelled our spiritual debts, our sins, our transgressions of God’s law, and this is what the note of debt refers to. In his crucifixion, Christ symbolically nailed our note of debt to his cross because his sacrifice paid our debts. We are no longer a slave to sin, but we have been adopted as children of God. Part of Gods family now. We are washed clean, as white as snow and we are now clothed with the righteousness of God. Through His sacrifice there is peace between God and man and now we can have relationship with God Almighty. A great price was paid, as it says in 1 Corinthians 6:20 “For you were bought with a price”. It is this victory that is so majestic on the cross. As Christians we are to die to sin and live to righteousness, dead to the old world and living for the kingdom of God. Are we willing to die for others, by this what I mean is, putting others before us? Putting the needs of others before ours: material, physical, emotional and spiritual. Christ walked in all humility, in order to do the will of the Father. Can you sacrifice your time to be with someone to listen to them, or to spend time to pray for someone as Jesus did? Are you willing to forgive others those who have made your life miserable, and hated you and bullied you just as Christ did? Christ always prayed for the forgiveness of all those who persecuted Him, because they did not know what they were doing. Are you willing to love those who hate you and talk bad about you? Christ came to die for the world, while we were yet in our sins. Don’t seek the peace of the world because when you see Christ on the cross He has purchased peace that passes all understanding for you. Don’t seek the love of the world, look to the cross to see the immeasurable love that Christ poured out for you that you might be washed clean of your sins and be part of the family of the living God. This is the wonder of the cross. May we be overwhelmed by what Christ has purchased for us on the cross, that we may always stand in wonder of His amazing grace. As we do that may we become the hand and feet of Jesus Christ, being a light to the world and a declaring of the good news of the Gospel to a world that desperately needs Him. All this is only possible through the Holy Spirit who now indwells us. Amen.